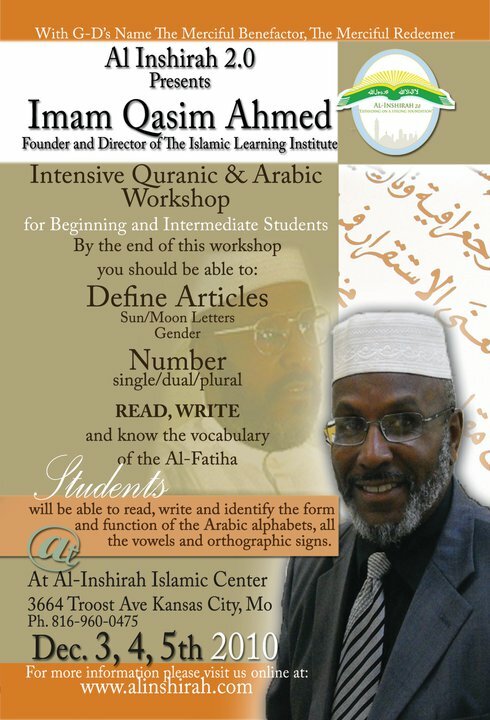 Imam Ahmed is the Founder and Director of the Islamic Learning Institute, Inc., where numerous students of Arabic and Islamic Studies have been taught to read and translate Qur’anic Arabic. The institute was founded in 1978 as a mobile school offering Arabic classes in various cities within the United States. Imam Ahmed has developed and teaches various effective workshops and seminars that expound upon such topics as Qur’anic Arabic, Islamic teacher training, educational curriculum development, family and community life, youth leadership development, and interfaith dialogue. Imam Ahmed’s teaching and training experiences have resulted in the production of teacher training literature, Qur’anic study workbooks, Arabic books and a huge collection of audio and video lectures to aid and assist others in studying and learning more about the religion of Al-Islam and Qur’anic Arabic. He also developed the “You Can Learn Qur’anic Arabic” Correspondence Course, which afforded students to learn Qur’anic Arabic in the comfort of their homes. His most recent literary development is a program called, “How to Make the Qur’an User Friendly: the Internalization of the Qur’an through the Subconscious Mind.” After years of studying and experiencing techniques using the power of the subconscious mind, he is currently traveling around the country hosting workshops to encourage his audience to believe in the power of their subconscious mind to internalize the Holy Qur’an in its original Arabic language. In his continuing efforts to educate others and to propagate the religion of Al-Islam, Imam Ahmed has traveled extensively in the United States and abroad. His first international travel was to the Holy city of Mecca, Saudi Arabia to participate in the obligatory ritual of the Hajj in 1977. Imam Ahmed’s thirty-five plus years as an Islamic worker provide him with the experience, initiative and direction that make him most welcomed wherever he travels and teaches. In 1981, he traveled to Indonesia to attend an international Qur’anic recitation competition. He returned to Indonesia in 1994 for a business development trip. Imam Ahmed has also traveled to Bermuda, the US Virgin Islands, Italy, Paris, and Canada. His most recent travel abroad was to Nigeria to participate in an International Islamic Affairs Conference in November of 2004, as an Islamic representative from the United States. On April 27, 2009, Imam Qasim was invited to perform the opening prayer for the House of Representatives in Tallahassie, Florida, making it an historic event. As an active participant in economic and community development projects, Imam Ahmed has traveled to China, Singapore, Honduras, and Japan. He traveled to China in 2001 as a guest of Mayor Lee Brown of Houston, Texas, for the purpose of developing international trade relations. He has also participated in many interfaith dialogs across the country. In the 1980’s, he earned the title of “City Imam” for his contributions in interfaith dialogues that bridged the gap and united Muslims with others faiths in the Dallas, Texas. Imam Ahmed’s early Islamic development began with The Nation of Islam, led by the late Honorable Elijah Muhammad. In 1975, he continued to develop more fruitfully as a Muslim under the leadership of the late Imam W. D. Mohammed.